Lymphedema is a condition in which fluid accumulates in an area of the body (usually an arm or leg). Unlike in regular swelling (edema), in lymphedema this swelling not only stays, but its presence causes the body to create more swelling in an attempt to remedy the condition. Since it is not possible for the fluid to move out of the affected area due to a damaged or malformed lymphatic system the affected area grows in size and the tissue begins to change. These changes include a hardening of the area (fibrosis) as well as fat deposition. Oftentimes it is hard to notice that Lymphedema has begun because the initial swelling is minor. However, some people who are at risk for Lymphedema have an injury which initiates the swelling process, so the onset is very rapid. Under normal circumstances, the swelling would recede as part of the normal healing process, but in the case of Lymphedema the area of injury continues to swell unless treatment for Lymphedema is received. One of the first signs of Lymphedema that is noticed by doctors and patients is what is called “pitting edema.” Pitting edema is recognized by pressing into a swollen area for several seconds with a finger and then when the finger is removed, the skin does not spring back into shape. Pain is not uncommon with Lymphedema, despite the belief in the medical community that it is painless. This misunderstanding among medical professionals often leads to misdiagnosis as they begin to look for other explanations for pain and swelling when found together. Lymphedema usually causes a feeling of heaviness that may be accompanied by an aching sensation. The area may feel stiff and numb, although the person is still able to sense when the limb is touched. Lymphedema shows up differently from one person to the next when it happens in the arms. It is possible for just a hand to swell, but the arm may still be normal. Likewise, the upper arm might swell, but the forearm and hand still appear normal. When Lymphedema occurs in the legs, it usually follows a distinct pattern beginning in the foot and ankle. The first time a person may notice the swelling is when a shoe that has been well worn does not fit properly any longer. Although there may already be swelling in the leg, it may not have been noticed. However, if the cause of the Lymphedema is cancer-related, swelling often begins in the upper thigh area. When more than one area of the body is affected, for example both arms or both legs, it is common for the swelling to be much worse on one side than the other. Due to the swelling caused by Lymphedema, tissue changes usually occur. The swelling is a form of inflammation which the body views as a type of injury. When an injury occurs, the body rushes special cells to stabilize the area. Normally, most of these cells break back down and the tissue returns to its original state, perhaps leaving only a scar at the site of injury. In Lymphedema, the body’s attempt to heal what it believes is an injury causes an over-abundance of this scar-like tissue to form. This is what produces fibrosis, or hardening, of the tissues. At the same time that fibrosis is taking place, the body uses special cells called stem cells to create fatty tissue in the area. In cases where Lymphedema goes untreated, the tissue changes may become quite severe. Drastic tissue changes are more common in the legs than in the arms. The fibrosis, or hardening of the tissue, may begin to create very thick callous-like structures. This is called hyperkeratosis. Cysts may form in the lymphatic system near the surface of the skin. These appear as bumps that will go down or deflate when pressure is applied to them. These are called lymphocutaneous cysts. A third possible change in the skin during late stage Lymphedema is the formation of hard, wart-like structures. These may be small, or they may grow to be very large. These structures are called papalomatoses, or verrucuae. 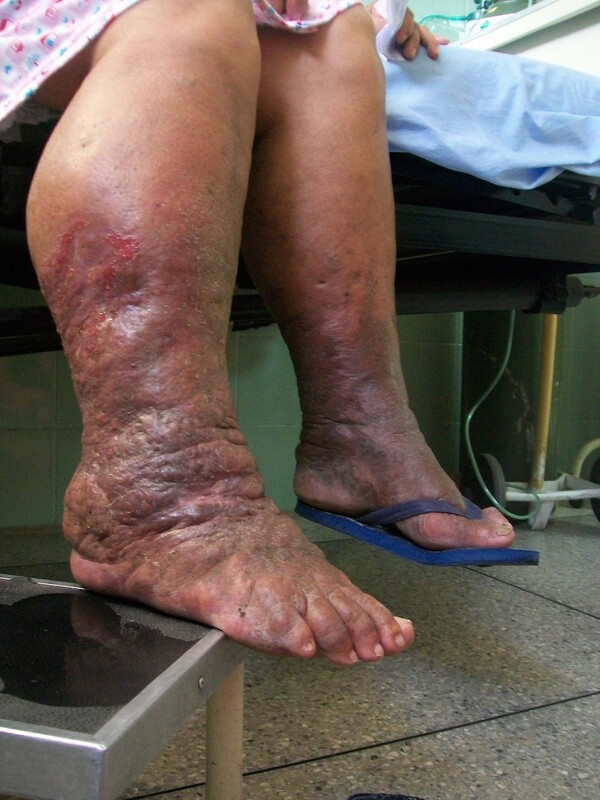 Redness may also be present in areas of late-stage Lymphedema. The redness is an inflammatory reaction to the overabundance of fluid and protein in the affected area. Although it is possible for ulcers to be found in late-stage Lymphedema, it is uncommon. Ulcerations are more typical of Chronic Venous Insufficiency (CVI) where the veins are not working properly and fluid is not being returned to the heart through the circulatory system. CVI often produces similar symptoms to Lymphedema, but the two diseases are distinctively different. When ulcers form due to a problem with the veins in CVI, they tend to be deep and have very clear borders. Ulcers in Lymphedema, by contrast are not very deep, they tend to weep, and their borders are highly irregular. 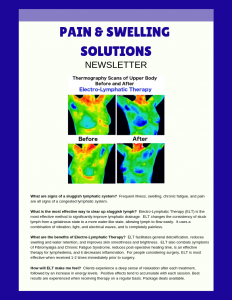 Make an appointment with Pain & Swelling Solutions. In addition to treatment, you will learn about lymphedema and how to manage it. Visit our Resources Page to find out what organizations and books could help you manage your lymphedema and cope with the psychological aspects of the disease. Take a look at the Educational Info Page for further detailed information about what Lymphedema is.